Just wanted to share a quick picture of a scrumptious lunch I “made” this week. The best part was that there was no cooking! I thought of it as a very French meal because the image my mom always recalls of her time in France is eating a fresh baguette and block of cheese. This is simply my Virginia take on that combination. My bread is a potato bread with sauteed onions I found at the farmers market this weekend. 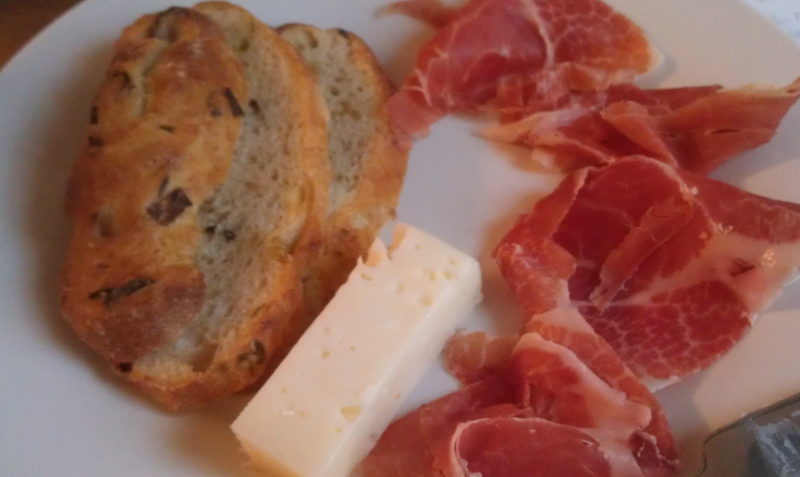 The meat is a Surryano ham from Virginia, sliced thin like prosciutto, but this ham came from a heritage breed pig which was pasture-raised right here in Virginia. It doesn’t get anymore local than that! I was introduced to this wonderful ham at a local, gourmet market located in the Charlottesville Main Street Market. Feast is famous for their artisan cheeses and assortment of deli meats, but they also have fresh produce and homemade sauces and local Virginia products as well. They make amazing sandwiches and salads right in the store too. I fell in love with the shop with my first bit of their ham, goat cheese, and plum panini. And the focaccio couldn’t have been fresher–it was from the Albermarle Baking Company right next door! The cheese featured in my lunch was lovingly selected by a gracious Feast employee who recommended it as the perfect soft cheese pairing for the ham. I ate the dish by layering the ham and cheese on top of the bread, but as I realized each element could stand entirely by itself, I just started picking up bits of cheese and strips of ham and eating them by themselves. It was such fun finger food, and I felt great eating a delicious meal of local, thoughtfully produced ingredients. Wow that looks so yummy! Next time I visit, I want to try that cheese.